The city on the edge of the southern steppe of Siberia is not full of obvious sites, but for the intrepid traveler there are unusual discoveries that can make a business trip fun or a stopover on the Trans-Siberian railway more than memorable. Omsk was founded in 1716 when a wooden fort was constructed to house a Cossack unit in the area to protect the expanding Russian frontier from Central Asian nomadic incursions. It served various administrative functions throughout the 1800s and became infamous as a place of exile and incarceration. The city was rundown when selected as a hub for the Trans-Siberian railway in the 1890s. Many international trade companies and foreign consulates relocated here and the remnants of their offices can still be found in the city today. Omsk became the headquarters of the anti-Bolshevik white army led by Admiral Aleksandr Kolchak in 1918. In late 1918 there was a revolt in the city initiated by a leftist faction (Socialist Revolutionary Party or SPs) with 500 rebel deaths at the hands of Cossacks and Czechoslovak soldiers, a major factor in convincing the SPs to join the Bolsheviks. There is a large Soviet-era monument to the uprising at the corner of Lenina street and Broz Tito street. Kolchak was entrusted with a large portion of the Tsarist’s gold reserves, yet amazingly lost much of it. Supposedly 250 million rubles were lost (about $8 million at the time). Legend has it that they were buried near the village of Taiga, yet numerous excavations have turned up nothing. The area still attracts the occasional fortune seeker. Kolchak’s headquarters are located at what is today the Omsk Regional Archives at Broz Tito St., 3. Nothing shows how much times have changed as the imposing Kolchak statue that was unveiled in 2012 around the corner. The statue guards Kolchak restaurant, a four-story culinary complex featuring a steak house, an Irish pub, a Central Asian café and an Italian eatery. 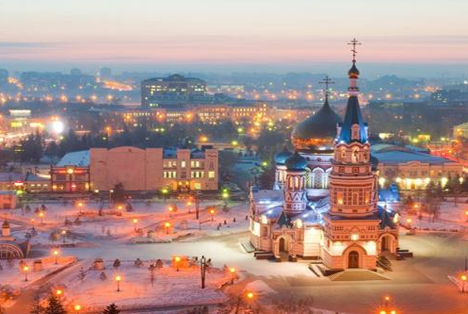 At 1.15 million people Omsk dwarfs the region’s second largest city, Tara (population 28,000). The city is split by the River Irtysh into two sections (all places of interest are on the right bank) with downtown emanating from the River Om. Most foreigners have heard of Omsk via writer Fyodor Dostoevsky who spent four years here as a prisoner (1849-1853). He spent most of his time in Omsk in squalor and chains and with no books besides the Bible, however, it left an indelible mark on his memory and influenced his future literary output. There is a statue of the writer in chains grasping a Bible at the corner of Partizanskaya and Spartakovskaya streets, where Dostoevsky undoubtedly stepped many times. A museum dedicated to the author's time in Omsk is located nearby at Dostoevskogo St. 1. The local university is also named for him. Tarskaya Street is one of the city’s oldest thoroughfares. It features a monument to victims of Stalinist repressions and the Tara gates, originally built in 1792 as one of the four entrances to the Omsk fort. Nearby stands the Assumption Cathedral, one of the largest churches in Siberia. Future Tsar Nicholas II laid the first stone here in 1891 when making his way back to St. Petersburg after his Eastern journey. In Omsk you are never more than a few steps from the village, made clear when one exits the center to the north, where most houses are wooden and roads unpaved. Stroll along Bulatova and Rabinovicha streets, a well-preserved ensemble of wooden architecture. The Pushkin State Library is worth a look with busts of Russian literary figures adorning the front side of the building. At the corner under the big “M” is one of several stations of the never completed Omsk metro. Construction began in 1992, but as of 2014 the project is again dormant due to financing problems. One of Omsk’s most famous sons is Symbolist painter Mikhail Vrubel (1856-1910). Vrubel ignored contemporary trends and focused on themes from fairy tales, demons and religious subjects and also designed a majolica frieze for the Metropol Hotel in Moscow. Omsk’s Fine Arts Museum is named for him and features a number of his works. Over the years a number of tourists have tripped over the monument to Stepanych. This bust of a plumber rising from a sewer was the idea of Omsk’s former mayor after a trip to Slovakia in the 1990s. Stepanych has become one of the symbols of the city. Omsk is a hockey town, with one of the major teams, Avangard, in the KHL, Russia’s premiere professional league. Russian champions on several occasions, check out a match at Omsk Arena. But if you can’t catch a game there’s a large kiosk featuring the team’s merchandise at the airport. While Omsk may not be on everyone’s radar musically, it does host a musical theater built just after the war. The building on 10 Let Oktyabrya Street is in the form of an enormous sloping grand piano. Perhaps Russia’s most famous punk band, Grazhdanskaya oborona (Civil Defence), was formed here in 1982. The band was active until 2008 when lead singer Yegor Letov died of heart failure at age 43. Letov is buried at the Staro-Vostochnoe cemetery. A sprawling graveyard with thousands of graves, fans should stop at the administration for help in locating his grave. One of Omsk’s longest running live music venues is Jazz Cafe Party Piano. With live jazz and rock every night of the month, it’s legendary throughout Siberia. Take a taxi as it’s hard to find. Other options for live music include the Viking Folk Bar and Harat's Pub. In Russia, Omsk is known among the younger, tech-savvy generation primarily because of the “Omsk bird,” also known as Winged Doom. The origin of what became one of Russia’s most ubiquitous memes comes from a painting by German artist Heiko Müller. One day in 2009 an Internet user posted this painting with the line, “Welcome to Omsk,” at the top. Additional versions menace viewers stating, “Don't try to leave Omsk,” and “Omsk is closer than you think.” Like many popular memes on the Internet, this one went viral and has become something like an unofficial symbol of the city.